(AP) -- Three Greenpeace activists on Sunday climbed up an oil rig off Greenland's coast in an attempt to stop a Scottish oil company from starting deepwater drilling in the arctic waters, the environmental group said. Greenpeace said the activists scaled the 53,000-ton rig Leiv Eiriksson, run by Cairn Energy, and are now hanging under it in a pod. It said the activists arrived at the rig in inflatable speedboats launched from the Greenpeace ship Esperanza, which had avoided a Danish warship shadowing them for days. The group has enough food and water to stay for 10 days in the pod, hanging a few meters from the drill-bit that would be used to strike oil, Greenpeace said. Cairn won permission this month to drill up to seven oil exploration wells off the Arctic island's west coast. Greenpeace has criticized Cairn, which is the only company drilling in the area, for not taking the extra precautions needed to avoid accidents such as the 2010 Gulf of Mexico oil spill. Cairn confirmed activists were attempting to disrupt the rig's journey to its exploration site offshore Greenland. The company said it "seeks to operate in a safe and prudent manner" and pointed out that authorities in Greenland have established stringent operating regulations, similar to those applied in the Norwegian North Sea. Greenpeace said it hopes the action can stall Cairn's plans to complete the exploration before winter, forcing the company to abandon the search for oil for another year. While Cairn is currently the only company drilling in the area, Greenpeace warned an arctic oil rush could be set off if the company strikes oil this summer. "We are preventing it from drilling because an oil spill up here would be nearly impossible to deal with due to the freezing conditions and remote location," Greenpeace campaigner Ben Ayliffe said. "A BP-style blow-out off the Greenland coast would make the Deepwater Horizon clean-up look simple." Greenpeace activists also climbed aboard the Leiv Eiriksson rig when it left a port in Istanbul in April, but were forced to abandon that protest due to bad weather. 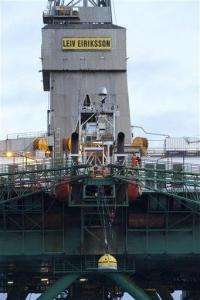 Last year, activists also tried to stop drilling in the area by climbing onto Cairn's Stena Don rig. 2. France: Russia, Japan and Canada announced today they will not join a second round of carbon cuts under the UN's Kyoto Protocol. 3. Western economies may survive! But Greenpeace and associates missed the boat ! Leaders of the Western scientific community - US NAS, the UKs Royal Society, UNs IPCC, heads of government research agencies (NASA, EPA, DOE, NOAA, etc. ), editors of once prestigious research journals like Nature, Science, Proceedings of the National Academy, Proceedings of the Royal Society, etc. - were also apparently unaware of their changing fortunes.